Pupils were challenged to a game of sitting volleyball by a gold medallist from the 2014 Invictus Games, to experience the challenges faced by those with a disability. Veteran solider Seveci Navelinikoro, known as Nav, was injured in Afghanistan. 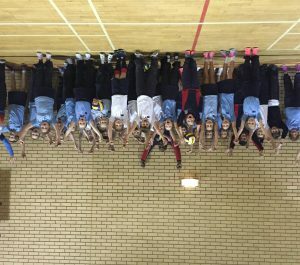 He taught pupils how to warm up using sitting volleyball techniques, carried out some drills, and then challenged the children to a game. Set up by representatives from Help for Heroes Phoenix House Recovery Centre in Catterick, North Yorkshire, the event was part of Red House School’s Citizenship Programme. The 36-year-old suffered severe injuries when the vehicle he was travelling in drove over an IED, three months into his operational tour in Afghanistan with 1st Battalion Mercian regiment, during Operation Herrick 17 in 2012. Nav suffered a mild brain trauma injury, lower back pain and nerve damage, damage to his left hip, loss of hearing in his right ear as well as post-traumatic stress syndrome. The father-of-two said he would be at “rock bottom” if it wasn’t for the support he has received from Help for Heroes. After his injury, Nav thought he wouldn’t be able to do sport again but through Phoenix House, he has been able to try a whole range of new activities. Having joined the Army in 2003, Nav has served around the world, including Northern Ireland, Kenya, Belize and the Falklands. He said sitting volleyball also helps his memory loss, as he has to train his mind to think about the next step. Nav, a lance corporal who grew up in Fiji but now lives in Catterick with his wife Kara and daughter, Akeneta, six, and son Adrea, four, said he had a great time teaching the children about Help for Heroes and sitting volleyball. He said: “I did some warm up exercises with them and taught them basic sitting volleyball and they played a game between themselves which was awesome. “The children listened intently as they heard first-hand from Nav about his experiences. They discovered how Help for Heroes support soldiers and how the work is crucial in assisting their recovery.